I am very passionate about the Australian cotton industry, and taking up every opportunity that is placed in front of me will not only build my own personal career, but it helps bring connections throughout the cotton growing regions of Australia. Hi my name is Alexander. I am 23 years old and I come from a great, loving farming family of four children. Being the youngest of the family, I was the child that always got that ‘special attention’ from my parents out of my two older sisters and brother. I was raised on an 800Ha beef/grain/cotton farm on the northern Darling Downs, about 30 minutes east of Dalby. My father managed the farm for 13 years, and it could have not been a better area to germinate the great passion for agriculture that I have today. The majority of my childhood was spent playing in and around of the farm house, with my mother constantly yelling at my brother and I about all the mischief we got up to. At a young age I developed a great obsession with machinery, especially tractors. This obsession would see me having little make-shift farms with my toy tractors around the house, and when it was too wet outside I would be inside the house, pretending to farm up the carpet floor. Me as a young fella checking out some of the cotton grown on the property “Plain Farm” which my father managed. 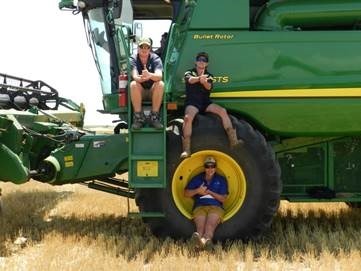 After the years of ripping up my mum’s gardens and eventually wearing the wheels off my toy tractors, my attention quickly turned to what was happening on the farm. My afternoons/weekends were spent helping my father, either feeding the cattle in the feedlot, changing syphons in the irrigation, or sitting on my dad’s knee with my hands on of the steering wheel of a tractor. 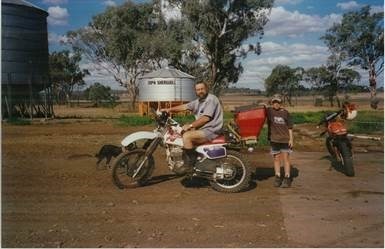 After the years helping my dad tackling jobs on the farm, and completing primary school in Dalby, it was time to ship off to high school. At this stage, the property on which my family had been living and farming was sold due to the drought which swept through the region in early 2000’s. However this gave my parents the opportunity to buy into a partnership with the previous owners of the property. So we packed up and moved three and half hours north to a small town called Wallaville, about 30minutes South/West of Bundaberg. This property was a whole different kettle of fish to what I was used to. It was a 700Ha (approx) citrus farm, and consisted of 60,000 fruit trees, the biggest fruit packing shed in the local growing area, lucerne which supplied the local area with hay, and about 300 head of cattle. 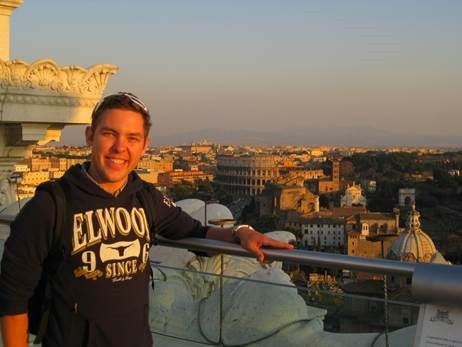 After 4 years of attending high school in Bundaberg, my interest in school began to fade. My parents then decided to send me off to the Australian Agriculture College (Dalby campus) to help me expand my knowledge in what I was more interested in: farming. This would see me excel in my subjects, and I ended up receiving 2 scholarships in 2008. One these scholarships with Oswald Brothers (a earth moving company) and Monsanto Australia helping out with cotton research trials throughout northern NSW and Southern Queensland. Attending agricultural college opened up many opportunities for me in the agriculture sector, including the chance to do work experience on my holidays. I was fortunate to be invited to spend time in the cotton growing area around Goondiwindi, with a well-known local farming family, the Corish family. 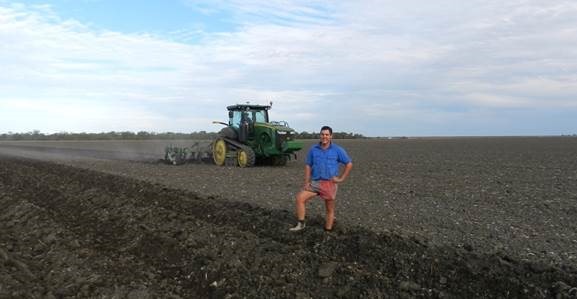 The Corish family gave me the opportunity to rotate across their farms, learning many skills off the highly knowledgeable farm managers. While doing my work experience with the Corish family, I ended up working and living with one of Peter and Kerry Corish’s sons, Nigel Corish. Nigel is now a highly respected farmer within the cotton industry in Australia. Little did I know all these years ago that working with Nigel Corish would have such effect on my life in the future. 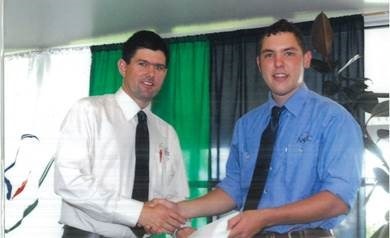 After my two years at the Australian Agriculture College, I graduated at age 18 with a Diploma in Agriculture. With this diploma under my belt, I walked straight into a farmhand role on a Jimbour Plains property, just north of Dalby. 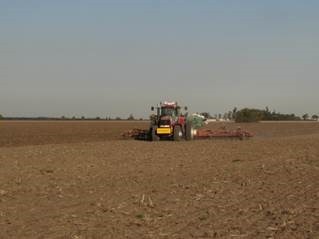 The farm is owned by Neil and Sonya McVeigh, and consists of about 2,800Ha of dryland and irrigation country. 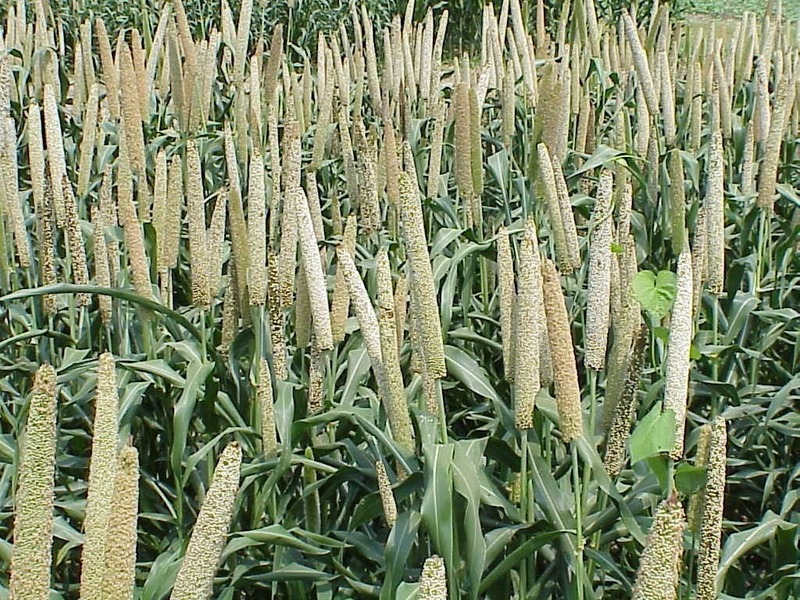 In summer, the McVeighs farm sorghum, cotton, millet, corn is grown; in winter, wheat, barley, canary, chickpeas. Though Neil had three sons of his own (Matt, Craig and Lachlan), I was treated like I was one of the family. The McVeigh’s farming enterprise was expanding rapidly, and I was given the chance to become care taker of one of their properties. With this responsibility came long work hours, and I would often miss out on nights out with my mates. Similar to most Australian cotton properties, we relied heavily on international workers (i.e. 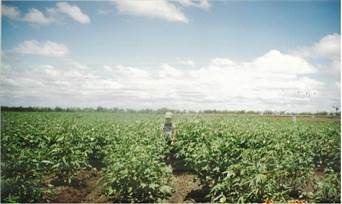 ‘backpackers’) during busy parts of cotton growing season, especially around cotton picking in April. I spent many long hours working side by side with the international workers, and I got to know them well. I’d listen to all the stories they had to tell about their home countries, and it made me think it was about time to pack my bags and head overseas. So in 2011 I flew to Europe on my maiden flight, and I spent three weeks tracking through countries such as France, Netherlands, Germany, Austria, Italy and Switzerland. After I returned, three and a half years of growing crops on the rich and fertile soils on the Jimbour Plains quickly flew past. I then decided it was time for me to move on to see what new experiences the world had to offer. 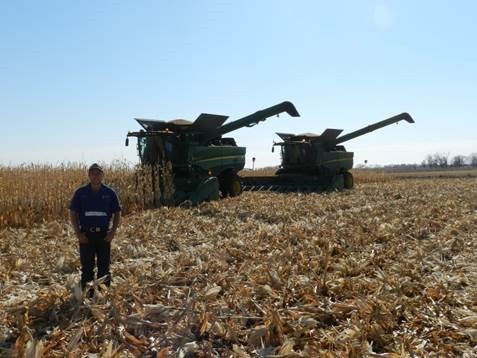 Although the McVeigh’s gave me plenty of great opportunities while working for their farming business, I knew I had to start expanding my career and my love for farming the land. So after a lot of phone calls, plenty of nagging to my good mate, and a long trip down to Sydney, we booked a one way flight to Kansans City, Missouri. We obtained a working visa with an American “Custom Cutter’ company, a header contractor in Australian terms. 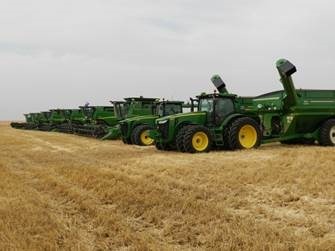 I then spent the next six months harvesting wheat in the summer, and corn in the fall, travelling from the great flat plains in northern Texas to the rolling hills of Montana. So far, this would have to have been one of the best experiences of my life. After returning to Australia in early November of 2012, and working for a farming contactor for 9 months, I had an urge to resume my career in growing cotton. Cotton has always been a part of my life, no matter what I was doing or where I lived. This passion for cotton would see me take up a leading farmhand role with Nigel Corish on his irrigated cotton/dryland grain farming property, just 15kms west of Goondiwindi. It was the very same property I had undertaken work experience on so many years ago. In addition to taking on this job, I am also now studying part-time for a Diploma in Cotton Production, through the University of New England. Australia produces cotton that yields two and half times the global average, and we are renowned for our high quality fibre. To remain competitive on the global market, it is essential that we as a growing community aspire to build on our high achieving attributes. That’s why I see that it is very important to build relationships outside the farming community to show how professional Australian farmers are generate pride in the community and abroad for what they grow and produce.